This is the Speedmaster 21 Strut with long mono brackets. The longer Mono bracket will allow the nose cone to fit up against the transom. But these can also be used on Hydros, Riggers or Catamarans of 27" or greater. Made of high quality aluminum, CNC cut to tight tolerances. 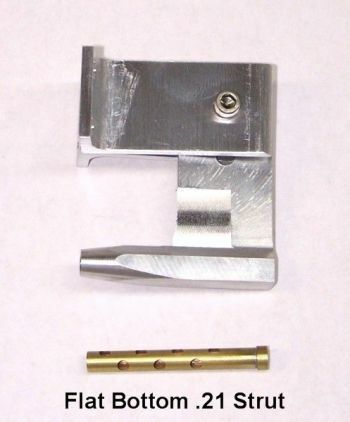 Also included is a cross drilled brass strut bushing that will accept 3/16" prop shafts. We offer this in a strut that has either a flat bottom or round bottom style. 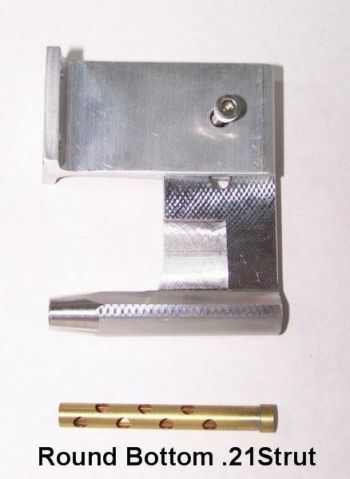 Flat bottom can be used to give more transom lift. Round bottoms are mostly used for mono's and catamarans. You may have seen this strut elsewhere for a lower cost, the difference is OSE packages these with the bushing which most all the other companies out there DO NOT!